Air Canada has launched a new flight mileage bonus for flights to over 70 cities in the AC network. The 30% bonus is good for flights in the New Year (Jan 7 to Apr 30) but you need to register and book by Jan 11. Like all flight promotions from Air Canada, bookings made before today (Dec 1) do not count towards the promotion. Even if you don't know you travel plans yet you should register for this offer right away. 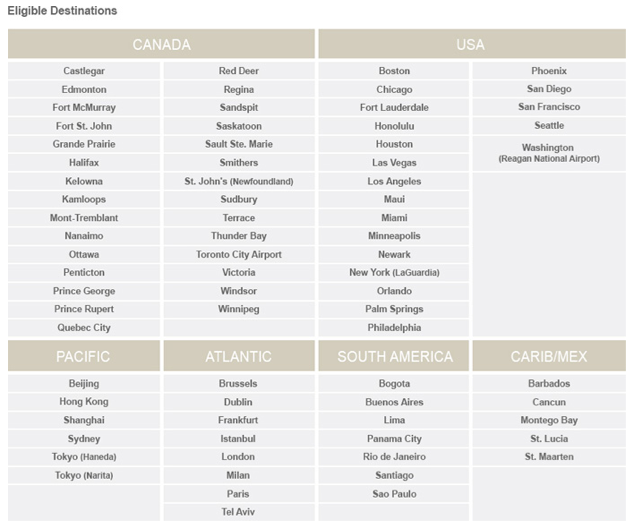 30% Bonus Aeroplan Miles on Air Canada flights to/from select cities Worldwide. To qualify, the roundtrip or two one‑way flight segments must be travelled in the eligible fare options: Tango; Flex; Latitude; Premium Economy Lowest & Flexible; Premium rouge; Business Class Lowest & Flexible.